We often have popular critics who oppose our sites and criticise us because of what we write on Hillsong. However, we need to acknowledge that it was one of our most popular critics who goes by the name of NewTaste that broke the story. Once again, this controversy falls straight onto the shoulders of Carl Lentz and Brian Houston. What are they going to say? It wasn’t the critics that broke the story, it was one of their own who vehemently DEFEND Hillsong. Now that the news is out, Pulpit & Pen decided to address this controversy again on social media. 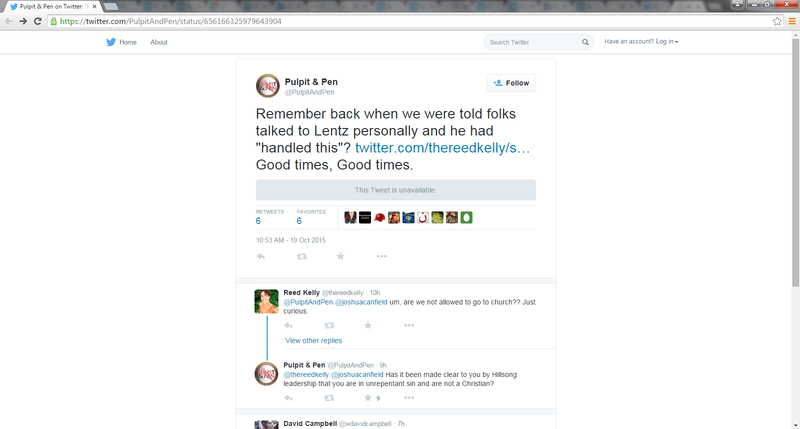 Here is the dialogue between P&P and Reed Kelly. P&P: Remember back when we were told folks talked to Lentz personally and he had “handled this”? https://twitter.com/thereedkelly/status/655922738587037697 … Good times, Good times. Reed Kelly: @PulpitAndPen @joshuacanfield um, are we not allowed to go to church?? Just curious. P&P: @thereedkelly @joshuacanfield Has it been made clear to you by Hillsong leadership that you are in unrepentant sin and are not a Christian? The phrase stranger danger summarises the danger associated with adults whom adults/children do not know. Hillsong are this stranger, presenting ear candy sermons and eye candy light shows. Sadly, Josh Canfield and Reed Kelly fell for Hillsong’s candy and got on the Hillsong bus. While Hillsong, Canfield and Reed may complain that Pulpit&Pen were mean or hurt Kelly’s feelings in the above tweet exchange, it was the right thing to do. Reed Kelly and Joshua Canfield are involved in an incredibly dangerous cult that will quite happily affirm their sinful lifestyle, capitalise off their success, leave them to the dogs and allow them to burn in hell for eternity. Pulpit & Pen are trying to help Kelly and Canfield to see what they are involved in. That’s not mean – that is LOVING. Josh Canfield and Reed Kelly got in the car with strangers and are defending their predators against those trying to help them see the truth. And what’s worse is the Christian media are neither acting like journalists or as Christians with their reporting on the Hillsong cult. Image from http://www.safety4kids.com.au. If the world gets it, why can’t Christians? Then again, it’s easy for these men not to see the truth when you have the Christian media defending these spiritual predators. (Not only are the Christian media defending these predators and crooks – they are promoting them.) It appears that Charisma Magazine, Christian Post, Charisma News, Christianity Today, The Bible Society, Eternity Magazine would rather defend institutions that lie before the Royal Commision and cover up paedophilia (which is a criminal offense in Australia) rather than promote Godly men who defend the Christian faith from these criminals and their cohorts. If secular journalism does not promote mafia networks, then why is it okay for Christian journalists to promote Hillsong? Will they continue to be propaganda rags for satan’s servants or will they actually grow a Christian spine and report with journalistic integrity and with the Spirit of Truth in them? Will there be PROPER journalism this time exposing the devious behaviour of Hillsong’s leadership over the Broadway couple? Or will they again release their attack dog Dr. Michael Brown to defend these spiritual frauds in the name of “love” and “Jesus”? Dr Brown came to Houston and Lentz’ defense last time. What’ll he do now? Become a browner Dr Brown? Christian news sites need to get out of the gutter and get guts. Let’s pray that the integrity of Christian journalism can be better than secular journalism. I agree CW – those who defend the undefendable need to repent of creating media ‘smokescreens’ for these wayward people to hide behind. The mere fact that these two men were moved right across the US continent in order to take pressure off Carl Lenz, appears to be clear cut proof that Hill$ong is more than happy to ‘hide the problem rather than fix it’. Disgusting, disgraceful, and disrespectful to those who trusted them to do the right thing in the first place – deal with sin in the camp!!! “10 And the LORD said unto Joshua, Get thee up; wherefore liest thou thus upon thy face? You like to blow hard on your breaking news and exposing. The two guys would have substantially more followers on social media than people who read the church watch sites. Any claim that anything on church watch was “breaking” news about them is laughable. “Strangers with candy”, that is the equivalent of gutter journalism. They have a combined around 29,000 followers on Twitter. More people go to just one of the Sunday church services at the Hillsong Church Hills Campus than read your websites. You just keep up the delusion that you are just SO important. Your websites are always still good for a laugh. Website counts are usually not cumulative – every visitor is only counted once not multiple times for return visits. So that’s how you boost your numbers. Matthew 7:13 explains why that is: “Enter through the narrow gate for wide is the gate and broad the way leading to destruction, and many are those entering through it.” Hillsong and the World and what Gays have to tweet are a lot more popular over on those worldly social websites, than what Jesus biblically says here. No, it’s the other way around. Your cult brain just keeps up the delusion that Brian Houston and Hillsong are just SO important. However you’ll see things differently on Judgement Day when Brian Houston and Hillsong finally get thrown under the bus once and for all.